Washington Monthly | Washington Monthly’s 2018 College Guide and Rankings Issue Is Out! How’d Your Alma Mater Do? 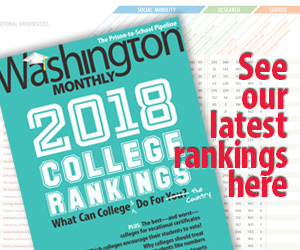 Washington Monthly’s 2018 College Guide and Rankings Issue Is Out! How’d Your Alma Mater Do? The Washington Monthly magazine today released its 13th annual College Guide and Rankings, which rate colleges and universities on their contributions to social mobility, research, and public service. Unlike U.S. News & World Report, which rewards institutions for prestige, wealth, and exclusivity, the Monthly calls attention to colleges that serve the best interests of taxpayers and the country as a whole—including by enrolling and graduating students of modest means. This year, the College Guide also ranks the best and worst vocational credential programs, the first time any publication has ever done so. While all of U.S. News’ top 20 national university rankings are elite private institutions, half of the Washington Monthly’s top 20 are public schools, such as the University of California-Davis, Texas A&M University, and Utah State. Half of the freshman class at some of these public institutions are first-generation and low-income students. Although some elite schools, such as Stanford and Harvard Universities, top the Washington Monthly list, others underperform. Johns Hopkins University, Rice University, and Northeastern University, which rank 11, 14, and 40 respectively on the U.S. News list, come in 62, 77, and 232 on the Washington Monthly rankings. Meanwhile, Augusta University, lowest-ranked on U.S. News, is 30 on the Monthly’s. Among liberal arts colleges, Berea College and Salem College, ranked 68 and 117 respectively by U.S. News, are 1 and 24 on the Washington Monthly list. Some types of vocational programs lead to decent-paying careers—others, not so much. Graduates of the No. 1 HVAC program on the Washington Monthly list, Perry Technical Institute in Washington State, make $47,685 annually. But graduates from the No. 1 medical office assistant program, at Colorado’s Front Range Community College, make only $28,560 a year, just a few thousand dollars more than someone with only a high school diploma. The gap between the best and worst schools within career programs is even bigger. Welding certificate holders from top-ranked Northern Wyoming Community College make six times more per year ($52,225) than those from bottom-ranked Peninsula College in Washington State ($8,739). The earnings differential for massage therapists is ten to one.